Santaberg – I Love It Spicy! In the spirit of giving, I present you the Chilehead version of Secret Santa. 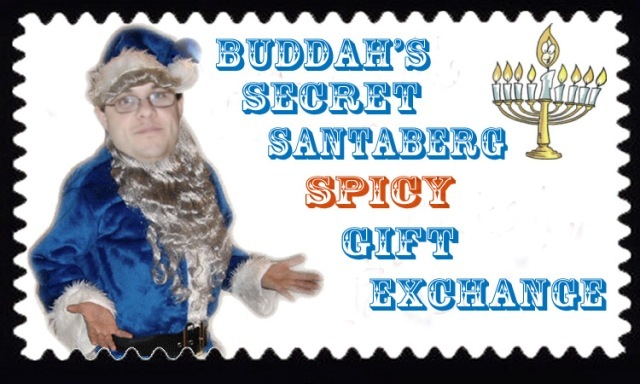 It is a holiday spicy gift exchange between people in our Facebook group: Chileheads 2. Since the original Chileheads group now has surpassed 5,000 people, (up 1500 from last year), I can’t risk the number of Secret Santas that might join in. Last year I created a 2nd group called Chileheads 2, which is now over 730 members. That group was meant to weed out all the pepper pics and the endless reviews and keep it more about the community that revels in spicy product making, great fiery recipes and festivals that people love to attend. Only posting this in the Chileheads 2 group, my hope is that it will keep the # of people relatively controllable for me to handle. Otherwise, Secret Santaberg might need more lil’ helpers. In the spirit of giving, I present you the Chilehead version of Secret Santa. It is a holiday spicy gift exchange between people in our Facebook group: Chileheads. Well, since the group is now teetering on 4,000 people, I have to put a cap on it. Last month I created a 2nd group called Chileheads 2. It was meant to weed out all the pepper pics and the endless reviews and keep it more about the community that revels in spicy product making, great fiery recipes and festivals that people love to attend. Since this is a new group, I am posting the Secret Santa there for people to see. This will keep the # of people relatively controllable for me to handle. Otherwise, Secret Santaberg might need more lil’ helpers.